We cannoli do so much here..
Socs Day Part II and Upcoming Social! 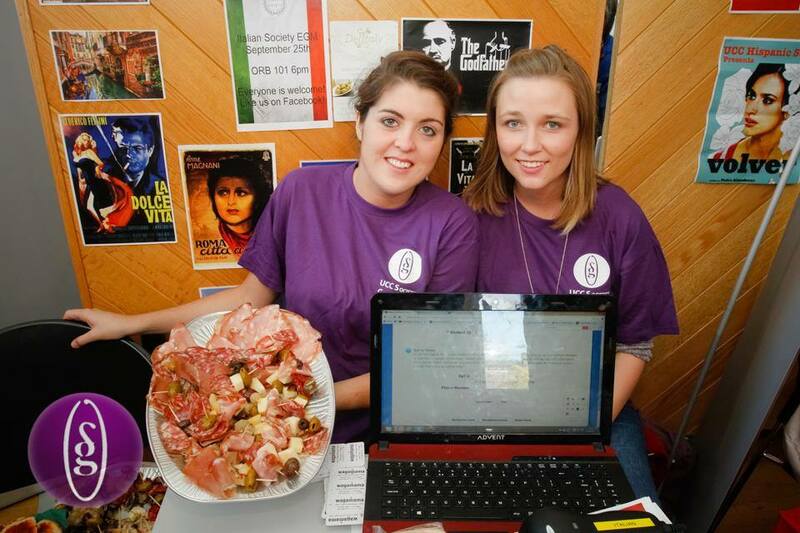 Tuesday, 14th January saw Societies Day Part II take place on the campus of UCC. The vitality of the students, the array of colours and the vast turnout of the societies was a refreshing addition to campus life, even for those few short hours during which the event took place. Despite the showery, chilly backdrop, both the societies and students alike made a special effort to brave the weather and spend the day outdoors. Their efforts were not unnoticed or unrewarded, as the day proved to be the ideal opportunity to meet new people, join new societies and catch up with friends and other members. Our society had a particularly exciting time during the day and met countless students (many of them part of the Erasmus program) with a passion for culture and languages – and good food! Thanks to The Boot for providing us with a very appetising spread once again. As you can see, the variety of cheeses, salami and ham did well to brighten up everyone’s day. Above all, it was especially rewarding to welcome brand new members to the society on the day. We are so looking forward to meeting everyone again! Speaking of which – we have an opportunity to do just that! On Thursday 16th January, UCC Italian Society will be hosting a social night, especially for Italian Erasmus students to meet and get to know the Irish students here in UCC. We’ll be kicking off the evening in the Franciscan Well (North Mall, Cork) at 8:30 p.m. Everybody is welcome, so feel free to bring your friends and have a relaxing evening with other students! Further details can be found here. Don’t forget to keep an eye on our regularly updated Facebook and Twitter pages. Hope to see you all tomorrow! P.S. We almost forgot to tell you that it’s pizza night at the Fran Well on Thursdays… You’re going to go now, aren’t you? On September 18th, we spent the day saying ‘Ciao’ to all of our new members and, most importantly, we brought a taste of Italy with us for everyone to enjoy! 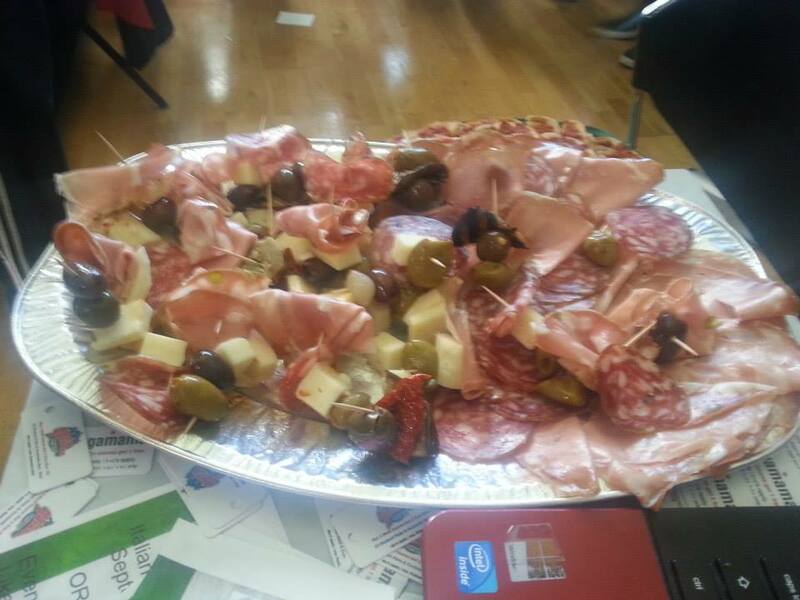 We had a mix of salamis, cheeses, olives, ham, mortadella and bruschetta at our stand, thanks to the hard work of Pasquale from The Boot Specialities in Cork. Mix of salamis, mortadella, ham, cheese and olives. We welcomed hundreds of new members that day, and it was really lovely to see so many people interested in our society and in the Italian language and culture (but mainly the food, we’re guessing!). The meet and greet feeling of Societies Day was over as quickly as it had come along and before long, we were busy making preparations for so many events that we have planned during the year. Our first event, which will be held in collaboration with UCC International Students Society, will go ahead TONIGHT!! We will be co-hosting a film screening of Academy Award winning ‘Life is Beautiful’, followed by a relaxing social in The Holy Cow. It kicks off at 8pm and will no doubt continue for as long as you want it to, so come along and take advantage of all of the special offers that we’ve been busy organising for the past while! It’s important to say that everyone is welcome, you don’t have to have signed up for the Italian or the International Students Society before. It’s a great way (the best way, in my opinion), to meet some interesting and like-minded people and kickstart those college friendships that last well into and beyond adulthood we’ve heard about in so many movies! We also have active Facebook and Twitter pages, which are regularly updated. Take a look! UCC Italian Society on PizzAmore!